Just stopping in real quick to share a card using some Woodgrain Silhouettes by Wplus9... Started off by stamping the woodgrain in Lemon Tart onto a white card base (I love how the woodgrain background image is long enough to stretch across the widest part of my card in one stamping). Rounded the bottom corners and wrapped with Hawaiian Shores twill ribbon. 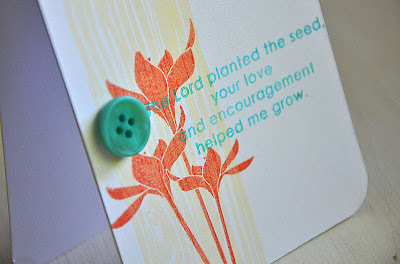 Layered the flower silhouette (in Melon Berry ink) and a sentiment (in Hawaiian Shores) over the woodgrain. Finished it of with a few perfectly placed Hawaiian Shores vintage buttons. Hope you all have a wonderful day! My friend Kim Wilson is coming over to craft and share her Lawn Fawn stamps with me today. Should be fun! Super Beautiful. I love the message. I love how you layered the stamps...just beautiful. LOVE this card, the colors are so pretty! 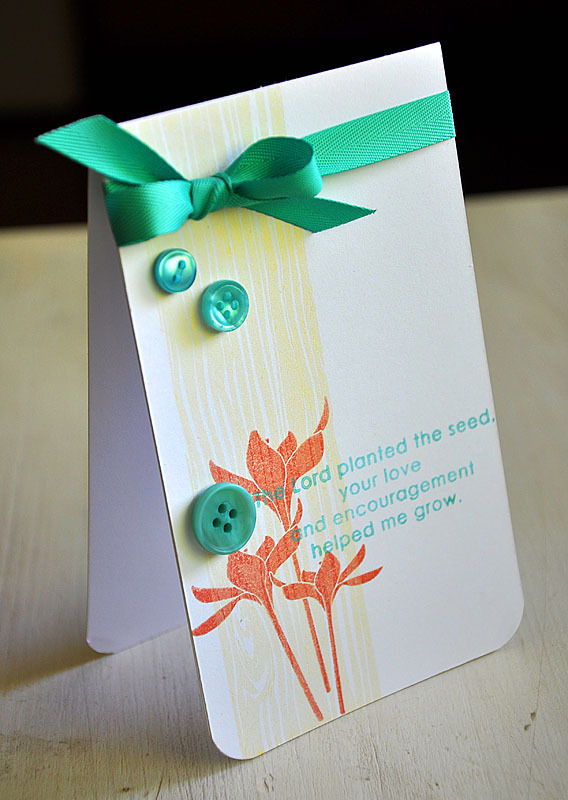 I dont know how u do it..definitly gonna attempt to make something like this card! beautiful card! thanks so much for sharing your beautiful creations with us. I've learned so much from you! so pretty! love the fresh summery colors and your layered stamping! just beautiful! love it! Ooo, such fun colors! Love this! This is soooo PRETTY, Maile!! Maile, these last two cards are just stunning. I love the ability you have to pick just the right colors to go together. Thanks for sharing your talent with all of us. So adorable girl! I had fun crafting today :) Did you see that I am going to be featured at W+9? What an honor! another beautiful creation.. hav fun sharing stamps today! So cute and so you Maile! A Little Secret & A Winner!